Reiki is a Japanese technique that treats the whole person including body, emotions, mind and spirit, creating many beneficial effects that include relaxation and feelings of peace, security and wellbeing. The Reiki practitioner (serving as a vessel) supplies healing energies by placing hands lightly on or over various energy centers of the body, from head to toe, activating the flow of energy or "chi". An individual may feel a sensation of warmth, pulsating rhythm, tingling or calmness and relaxation. Reiki increases our natural life force energy, bringing a state of balance, on all levels - mind, body and spirit. Reiki is in no way harmful, nor does it have any side effects. It is Universal Life Energy and it's purpose is to heal. Reiki is not intended to replace physician treatment/medication, but to work in conjunction with it. Recovery: Reiki can assist you in recovery from medical treatment and operations (shortened healing time). Injuries: Reiki can aid in recovery from injuries. 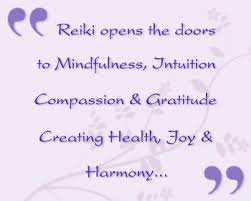 Well being: Reiki can help promote general well being - improving the immune system. Stress: Reiki can treat stress and help with insomnia. Pain: Reiki can bring relief from chronic pain. Relief: Reiki can relieve allergies and headaches. Regulates: Reiki can regulate blood pressure. Hormonal: Reiki can ease hormonal disorders. Therapeutic: Reiki can sooth tight muscles. Relaxing: Reiki can help induce a state of deep relaxation. Emotion: Reiki can heal emotional problems you may be experiencing.